Is it just me or does the "fall back" day of daylight savings time make for the longest day ever? Oh, don't get me wrong, that extra hour is fine and dandy in the morning but by evening time I'm thinking the whole shebang just needs to be over. Who's bright idea was Daylight Savings Time anyway? Um...that would be Richard Nixon. At least I think so. I just remember my mom grumbling about DST back in the day and my dad saying it was all Nixon's (I am not a crook!) fault. We had a lazy daisy weekend with nothing major on our to-do lists. In fact, we didn't even have to-do lists. Sweet. Annelise played, I did a few crafty things (post coming soon) and Scott's goal for the weekend was to rest his neck/shoulders and back in a concerted effort to allow his aggravated muscles/disc/nerves/whatevs to heal. Since he hardly got out of the recliner over the two days, I'd say he met his goal. 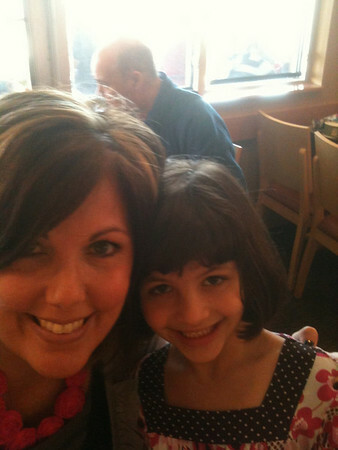 Annelise and I had a mother daughter lunch date at Panera after church yesterday. 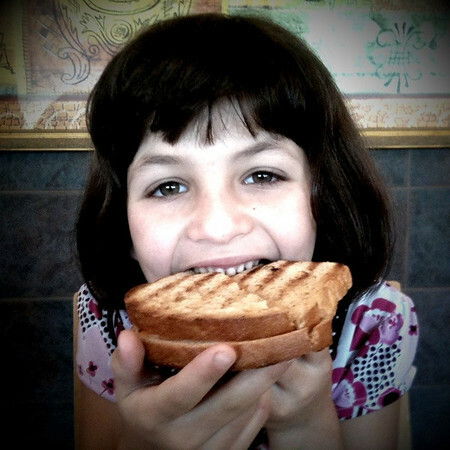 Can you tell she really likes their grilled cheese sandwiches? 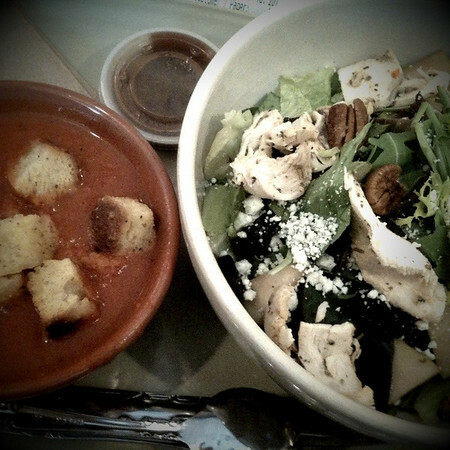 Creamy tomato soup, with croutons (the croutons are critical to this soup's rating on my personal soup-o-meter) and their Orchard Harvest salad with chicken, dressing on the side (otherwise they put way too much and the once perfect salad just drips and wilts and becomes rather depressing). Okay, great, now I'm hungry. My body thinks it's lunchtime at 10:30. Lame sidenote: Even with the extra hour Annelise and I were still five minutes late to church. That's truly pitiful. Your Panera meal looks so good! That's too funny that you two were late to church. We go at 2:00 and I'm amazed at how many people still get there late; I think it has something to do with thinking they have tons of time and then it gets away from them. It would happen to us too except we go 30 minutes early to ensure a soft seat, our tailbones can't handle the hard metal chairs in the back!